What’s different about the labs, compared to traditional planning methods? How do they work? And why are they increasingly important? So what are Social Labs and why are they increasingly important? actors within the system are constantly adapting their behavior. Many problems of our time qualify for a social lab approach. Or to put it the other way around: cannot be solved any longer by traditional planning methods and technocratic approaches. That’s a characteristic of this time of transition, where most of our social and natural systems are on the verge of collapsing and a lot of problems are interrelated. Think of: climate change, large scale migration, biodiversity loss, resilience of local communities, the state of our democracy, the state of our oceans and coral reefs, etc. The primary reason why complex challenges such as the above don’t qualify for traditional planning methods and technocratic responses, based on the combined capacity of existing institutions is that complex challenge have what could be thought of as ‘an engine’ that produces the symptoms we are most concerned about, be that too many hungry people or too many greenhouse gas emissions’. Technocratic approaches don’t usually discover and change the underlying causal dynamics; they merely focus on the symptoms and try to deal with those. Furthermore, they bet on the fact that our ability to optimize will be faster than the rate at which our problems grow. And: technocratic approaches address parts in isolation, rather than the whole. Social labs are different than technocratic, planning approaches. They don’t start or stop with analyzing the problem, pre-estimating the size of the problem and then determining a plan. Rather, they do all those things, iteratively, so not sequentially and also focus on growing a very particular capacity within stakeholders: the ability to sense and actualize emerging realities. In their book “Leadership in the Digital Economy” Jaworski and Scharmer argue that this particular capacity is crucial to doing well in the current, digital economy. In a change lab, a group of stakeholders work to surface their own ideas for what will effectively shift a system from its current unacceptable state to a desired future state. The change lab starts by bringing participants together around a broadly defined area, usually represented by a question (pg 52). The lab then follows the U-process, an innovation process that allows for deep systemic change to occur by moving through the stages: seeing with different eyes, sensing, presencing and realizing, by crystallizing and prototyping. As I’ve come to experience with the U-process, it is much more able to address fundamental systems dynamics, for it also works on the level of our consciousness and thinking around a problem. What ingredients make that such labs work? Over time, Social Labs become environments that support innovation. Social Labs are special since they combine theory, technology and practical, or embodied wisdom. Aristotle call this ‘episteme, techne and phronesis’. The world where the modernist planning paradigm and technocrat strategies rule in response to complex social challenges, is not only dangerous: it simply doesn’t work. Under conditions of true complexity where the knowledge required exceeds that of any individual and unpredictability reigns – efforts to dictate every step from the center will fail. Think of a pilot in a heavy storm, or a surgeon during a complicated procedure where power breaks down. Phronesis works in the face of complexity. It operates by developing and then providing us with a set of heuristics – codified rules, or checklists – based on experience, which help us make decisions in highly complex situations. Perception of the particular, as opposed to the universal, is a major distinction between practical wisdom and what we could consider natural science (pg 89). Social Labs build on phronesis of all participants, and stimulate the development of phronesis, through an iterative process, with a diverse team. Another thing that is special about Social Labs is that they work from the vision that the world is inherently non-dualistic; that is to say, they are designed in such a way that they acknowledge that there is no such thing as a subject, that perceives the objective world, rather the two are the same. Heidegger wrote about this in his most famous book ‘Being and Time’, and introduced the German word ‘Dasein’ (being here), which is the origin behind the word presencing, as used in the U Process. The way that stakeholders perceive the ‘financial crisis’ or ‘climate change’, is part of the lab process and will be influenced as the innovation process unfolds. Another thing that is special about Social labs is that they actively stimulate the chances that ‘events’ take place that have the power to change systems structures. Labs serve as a site for events; simply by putting diverse people together the probability increases of ‘events’ that have meaning and allow the system that is studied to adapt and evolve. Zaid highlights how special this is: events fall outside of what currently exists and hence outside of conventional modes of knowing. There is no proving them; there is only doing them and learning from this doing. At the same time, we know that we cannot generate new systems, new structures and new realities, that are verifiable prior to their coming into being. From this logic it follows that we need events, to help us change our thinking, our theories, and help us shape the technology needed for further systemic change. I want to say a bit more about this. Most systems thinkers see ‘events’ merely as indicators of underlying patterns, caused by systems structures (both physical structures and soft structures – our assumptions and world views). Zaid explains that Social Labs work from the understanding that Nassim Taleb spoke about in his book Black Swan, that ‘black-swan’ like events (9/11 – the first black president in the US – Zuckerberg giving away his fortune) happen all the time, and can have enormous impact on our thinking and as such on the deepest layers of our systems. Systems thinkers don’t usually think about the possibility to actively create systemic space, in such a way, that powerful ‘events’ might happen. Within Social labs, the power of events, is never underestimated, and a lot is done to increase the chances of impactful events happening. During the Sustainable Food Lab key stakeholders stayed in a local village for 10 days, and ate the exact same food as local villagers, in the same quantity, one meal a day. This led to many powerful conversations and changes in thinking with key stakeholders that had enormous consequences in the unfolding of the systems change process. How to know if a social lab works? Zaid helps us think of the value of a lab by putting on a ‘capital lens’. Whether you think about maintaining the systems around us, or ask yourself what is needed when systems are on the verge of collapsing, it is easy to realize that different types of capital are needed. Not only financial capital, but also social capital and intellectual capital, to name a few. A lab works when it creates a diversity of capital, beyond financial capital. We all know that success in the market economy is conventionally measured in single forms of capital, or ‘mono’ capital. How much money does a firm make? Money however, is not enough to change complex social systems. Changing complex social systems requires that actors have competencies (human capital), the knowledge and understanding of what is to be changed (intellectual capital), the infrastructure and services required to deliver services (physical capital), the ability to pay for whatever is needed in order to do their work (financial capital and the networks to organize themselves (social capital). Social Labs that work well generate all these forms of capital, by deploying all these forms of capital and by doing so they help change social systems for the better. Social labs acknowledge that human systems become more productive the faster that the key ingredients of innovation – talent, ideas and capital – are allowed to flow throughout the system. If this flowing of talent, ideas and capital is done well, labs will generate more overall capital than they cost and they will not drain out. On the contrary, they will become increasingly stronger ecosystems for innovation, supporting change in complex social systems. How does change occur in Social Labs? This particular image is not shown in the book, but it can be found in a brochure of REOS partners, the company (a social enterprise) that the author Zaid Hassan is from. 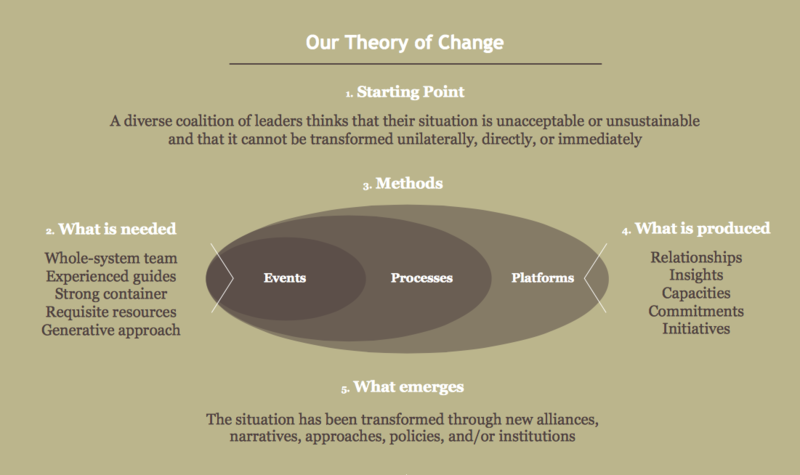 Reos’ theory of change focuses on events, processes and platforms, which aligns well with how I’ve come to experience and think of systemic change. ‘Whole-system-in-a-room’-events, such as a Future Search, as well as smaller, more personal events (1-on-1 dialogues, learning journeys, etc.) are very powerful to kick-start a process. This process can lead to and be supported by a platform that emerges. A successful platform can never be created without a powerful process and meaningful events. And a platform should never become a goal in itself. At the same time, events and a process without a platform are less likely to succeed long-term. When all goes well, the combination of events, processes and a platform, supported by powerful methods, and kick-started from a strong intention, can allow new structures and narratives to emerge and can help to build up capacity, insights and relationships, as well as commitment and initiatives. In the book Zaid mentions seven rules of thumb for starting a social lab. 1) A very clear intention – ‘without it, don’t even try’, the author says. I know this from experience. The projects that I started with the clearest intention, were my all-time best and most impactful projects. Magical, unexpected things would happen in those projects, when you’d least expect them, something bigger than the team and the participants, would make sure all went well. Intention can serve as “a strange attractor” (a systems theory term) and all sorts of help flows to it. 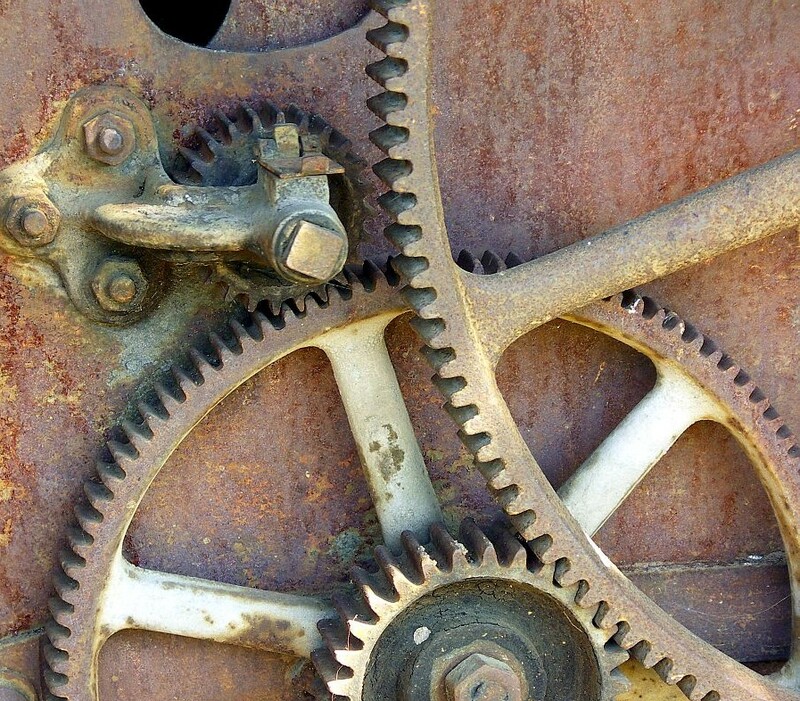 2) A great and broadcasted invitation – a common truth for all systems change efforts: spend time ‘sloganeering’. ‘A slogan invites people to rise above their petty concerns and to join in. It promises them greatness’. From the book: ‘A good invitation is mythic, a call to adventure; it incites romance and excitement and it raises our game. It takes craft to get right’. 3) Work your networks – relying on your networks and the networks of your networks to get the invitation out. 4) Recruit willing people – you need a team that has been built to react and respond to complexity. Zaid says: first you try to find a small group of like-mined organizations or individuals with some convening power. Then; you locate two or three key partners who are willing to lend their names and open their networks. With these partners you try to find at least 30 more individuals, representing different parts of the system you want to impact. Build a lab team and a secretariat for this group. Don’t make the lab team bigger than 36, for it’s hard to build trust in a starting group bigger than this. 5) A strategic direction and the creation of space – Zaid makes sure you understand that complex social challenges are too complicated for grand strategies. What is needed instead is a very clear strategic direction and enough space to manoeuver. Within that space you should allow multiple actions to unfold aligned in a strategic direction. 7) Cadence – or: a pace that’s sustainable – make haste slowly. Don’t overdo; make sure everybody keeps breathing and stays alive! There’s a tendency to make labs really intense experiences. Zaid warns to make sure the pace of the lab is sustainable for all; the lab team and the secretariat. A social lab must be social; participants of the lab are not simply experts, whether they’re academics or activists. Rather, team members must reflect the diversity of the stakeholders with the issue at hand’. Also: to justify being a lab, the lab must undertake work in an experimental and iterative way to address challenges. A program is very different from a lab (pg 127). Warning: Social Labs or war? And then there’s a relevant warning. One that also highlights the importance of labs. Zaid says: ‘as our social problems become worse and worse, there’s a tendency to go to war with our problems. Think of: the war on drugs’. Social labs represent the constitution of a new sphere of activity, a new space. The gathering together of people within this space represents the beginning of what can be thought of as an armistice, a suspension of what has been called the battle of the parts versus the whole. People come together, realizing the truth that the cost of war is too high and there is another way’ (pg 127). Klimaatverandering is ‘serious’ – toch werkt absolutisme averechts. Waarom? Thank you for this inspiring and clearly written introduction to the theory and practice of Social Labs. Good to hear that you liked this intro. Zaid Hassan will give a training on Social Labs in March, which I subscribed to. If you’re interested, let me know and I can send you the invitation. Please send me an email about it.